Green Grandma: Remember when pistachios used to be red? Remember when pistachios used to be red? The other day, I found myself wondering what ever happened to red pistachios. Do you remember them? Your fingers used to bear the red stains from shelling them. So why now are they a beige-green color. Obviously, they're not red when they're harvested, so why were they dyed that color? I must admit, I kind of liked them that way. It's not like we were actually ingesting the dye... it was only on the shell. The pistachios themselves were still a light beige-green. Well, I found out that back in the days when nearly all pistachio nuts were imported, the only color they came in was red. And here's why: the nuts were all picked by hand and because of the natural oils present on the hands of the workers, the pale beige shells became discolored. Apparently, consumers thought they looked soiled and unappetizing, so they weren't a popular choice for a snacking. 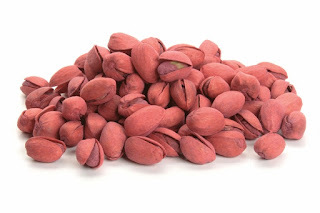 Importers of the nuts wanted to find a way to hide the stains on the pistachio shells and increase sales, so they began dying the shells red with food coloring. The dye not only concealed the stains that some people thought were blemishes, but the red pistachios stood out from other kinds of snack nuts and sales picked up. The plan worked quite well and red pistachios became so popular that the nuts were eventually grown right here in the states. Around 80 years ago, machines took over the harvesting, so there was no longer a need for the red dye. But they remained red for years after that, probably because of the uniqueness of red nuts. After all, they stood out amidst the various shades of tan and brown common with the other types of nuts. Personally, I can't remember when the change from red to natural occurred. One day I was buying red pistachios and the next I was buying naturally-colored ones. Hmmm. I just didn't notice. How many of you remember having red-stained fingers from eating a bowl of pistachios? While the color of pistachio nuts for sale in most stores is the natural greenish-beige, anyone wishing to purchase some red pistachios for old times sake, you can still find them at specialty stores and online sites. Although the nutritional content of red pistachios is the same as the those left natural, they make a colorful addition to the snack offerings at a party or holiday gathering. And hey, a little red dye on your hands isn't going to hurt anyone. Just don't swallow the shells -- the red dye won't be the worst of your problems!